It’s easy for all of us to list lots of ways that lizards are different from people. For example, most lizards are much smaller than us. They are also scaly and don’t like the cold at all, so they’ll never get to experience the joy of a rowdy snowball fight with their best friends. But lizards and people have similarities as well. For one, lizards can use different “languages” to communicate with each other! Some lizards show off parts of their bodies to send a message to another lizard. Our good friend the green anole has a throat fan – called a dewlap – that they can extend to tell another anole to go away. The frill-necked lizard has an even more extreme version of this. They can extend a flap of skin all the way around their head and look like an intimidating dinosaur, especially if you’re small. These are examples of visual communication (or, body language), which is one type of language that lizards can use. But, just like human languages, not all lizards can understand these messages. Other kinds of lizards use what is called chemical communication, which could be considered another language. 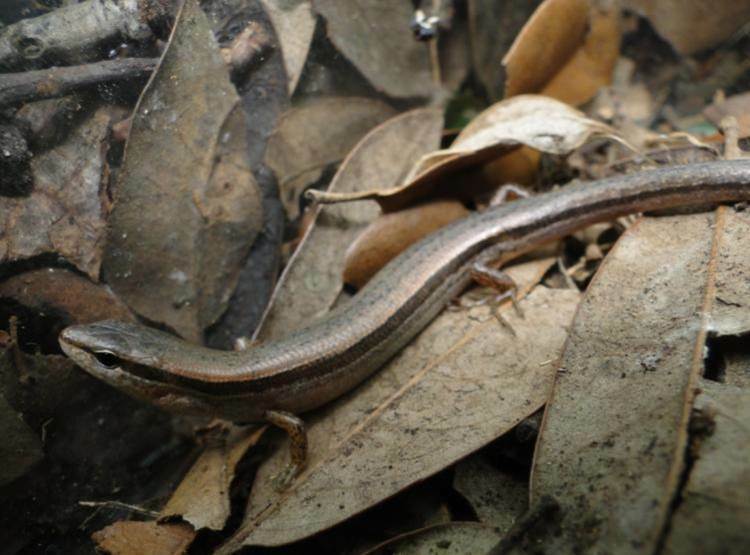 These lizards (like the skink shown in the picture above) spread chemicals called pheromones (sometimes through glands on their legs, and sometimes through their poop!) to send a message to other lizards. For another lizard to understand the message, it has to “smell” the chemicals so their brain can figure out what the message says. Most lizards smell with their tongue. A lizard will stick out its tongue, much like what you may have seen snakes do, and lick some of the chemicals. The tongue then brings the chemicals to a special organ in the roof of the lizard’s mouth that allows the brain to figure out what the message was saying. Another similarity that lizards have with people is that some of them, but not all of them, can communicate in multiple ways, as if they were bilingual. One of my favorite lizards, the spiny lizard, uses both visual and chemical methods to send messages to others. They try to look intimidating by doing big pushups (visual communication) but also send messages by putting out pheromones (chemical communication). It’s always fun to watch these guys communicate out in nature. I hope the next time you’re outside you get to see some lizard messages of your own! Chris graduated from the Lizard Lab in May 2014, and now he's working as a scientist at the Health Science Center in San Antonio. And, he's an expert at Ultimate Frisbee!